I have a mountain of pictures on my computer just waiting to be edited and uploaded to Flickr. A mountain, I tell you. But I have absolutely no motivation to do so right now. I'm tired. You know? Like, really tired. Like, I can barely keep my eyes open to write this post. Since March, I feel like the last few months have been crazy and busy. And then I went to New York recently, and then, I went to France two weeks ago. To make the crust, in a medium mixing bowl, stir together graham cracker crumbs, melted butter and 3 tablespoons sugar until well combined; press evenly into a 9-inch pie dish. Bake for 8-10 minutes or until golden brown. To make the filling, in a large mixing bowl, using a mixer on high speed, beat egg whites and cream of tartar until soft peaks form; gradually beat in 1/4 cup sugar until stiff peaks form. In an additional large mixing bowl, beat yolks, sweetened condensed milk, lime juice, lime zest, vanilla and salt until well combined - about 1-2 minutes. Fold egg whites into lime filling until combined. Place filling into pie crust. Bake 18-20 minutes or until light golden brown on top and filling is set. Cool on a wire rack for an hour before chilling completely in the refrigerator. When cool, make the topping: beat cream and 1/4 cup sugar, in a large mixing bowl, using a mixer on high speed, until stiff peaks form. Spread whipped cream evenly over pie. 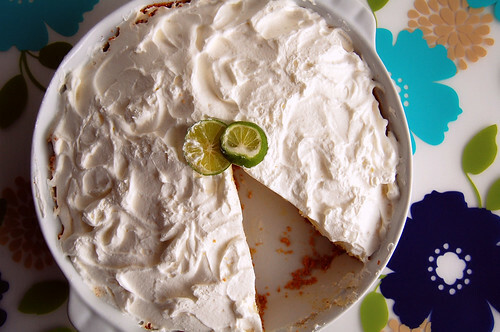 43 comments on "Key Lime Pie"
Since your dad won't beeating it, hope you save a piece for me ;)! I so agree with everything you wrote about your first travelling to France. One of the things I love the most when I travel is to get to learn about local food, for me it's more important than any museum. I had been thinking of making a key lime pie for weeks and this is just perfect. I'm going to use your recipe. My husband went to France last year and loved it. He told me the bakeries were just amazing and that McDonald's there is nothing like it is here...they even have pastries there!!! This pie looks fab - makes you want to sink your teeth right in. Wow, 2 weeks in France - that its fantastic! I have only ever been there for 2 days, and then only in the touristy parts of Paris with a tour group. I was wondering when you were going to mention France:D I was there when I was Hannah's age, in fact did a trip for 3 months through Europe. It's cool that that is where you're dreams were realized. Stick to those deams and the world will be your oyster. France? Well hello! I have never tried key lime pie if you can believe that one. Ahh France! I hope you gorged on pain au chocolates, and I can't wait to hear about the rest of your trip! Can't wait to read about your trip! The key lime pie looks delicious--my dad is getting monkey bread for his Father's Day breakfast! Hellish trip to France? What happened?! I hope you at least had some good times as well!! You pie looks perfect Emily. And I can't wait to read about your trip to France. It is truely a magical place. Can't wait to hear more about your trip! Going to Europe after college is what inspired me to cook as well. I like the whipped cream on top of your pie and agree it's much better than meringue! I'm sorry to hear your France trip wasn't all you imagined it would be :-/ bummer! Can't wait to hear those stories!! How many limes did you have to squeeze?!? You're so sly...not letting anyone know you went to France until after! :-) And in fact, my dad's favorite dessert is lemon ice box pie...so I'm SURE he'd love this! 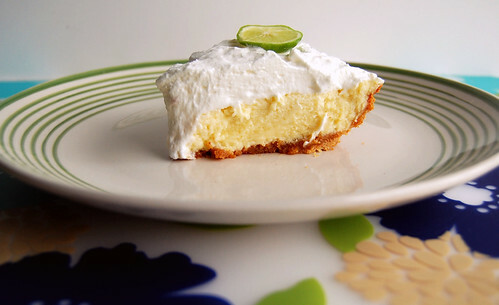 seriously, you are talented--i don't normally get excited for key lime pie, but you've made it utterly irresistible! So jealous of your trip to France! I still haven't been. Can't wait to hear more about it (hellish?? Oh no!). You guys still took a cute photo. And the key lime pie looks ridiculously awesome! THAT'S what I'm making on Sunday. Definitely. 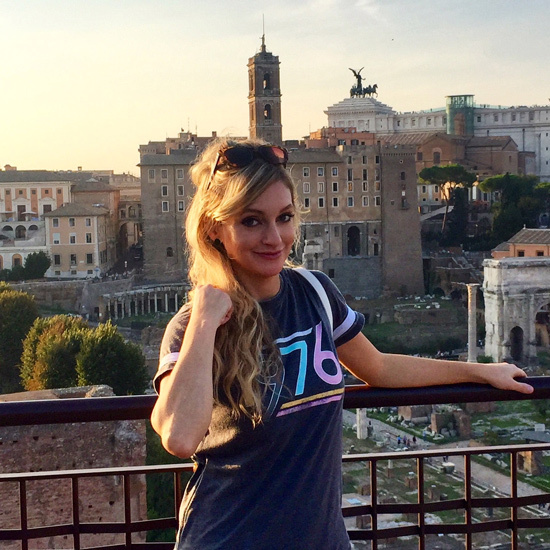 It's such a drag that your trip had some glitches, but isn't Paris under a few bad circumstances better than Paris not at all? I'm so glad you topped that key lime pie with whipped cream and not meringue. It looks incredible. I LOVE Key lime pie. I am definitely going to try this!! This looks so yummy!!! Yeah sunday i'm going to make it sunday for my family for fathers day!! One of my favorite desserts! Looks mouthwatering, sweetie. You and your sister are adorable! and great lookin pie! refreshing and great for summer! I saw your France pictures on Facebook and was thinking, oh my gosh, I didn't eve know she went to France. I want to know more about your trip...I remember my first pain au chocolat as well as my first Nutella crepe. My life has never been the same since. Have a good weekend Emily! gorgeous pie...yes, every dad, it IS a fact! never been to france, but by the sound of the coffee and pastries I really need to put more effort in to getting there! Oh, snap. I saw key limes for the first time this year and they are TINY. Your pie looks so creamy, so good. Getting to working on that mountain! I just made this for our fathers day dinner. I love how light and fluffy it looks. Can't wait to try it! 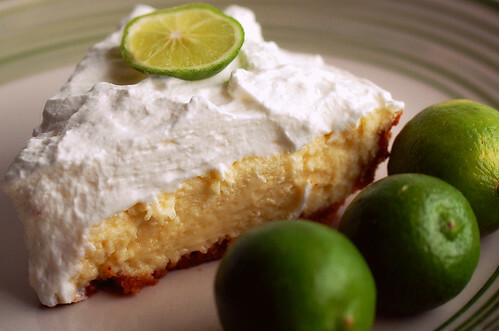 I love the taste of key lime pie; these key limes are a killer. Just had a mint lemonade at lunch and it reminded me of these key limes; hope you get to go back to France; i lived there a few years and still feel like I need to go back and explore so much more. I can't wait to hear about your trip. I went to France about 9 years ago, and I would love to go back. I love key lime pie and this one sounds AMAZING! Wow, can I come and have some of that pie? I love key lime pie, but there isn't anyone in my family (or in my vicinity) who likes key lime pie so I can't make any! If I do make it, then I will be forced to eat it all on my own and that would not be a good thing. France is an incredible country with an out-of-this world food culture and appreciation. It is no surprise that you found your foodie calling there! Debbie, wow, really? I regret not going into a McDonalds while I was there. Marla, that's what I've heard. No, we didn't have to stay in one of those, thankfully. Puppy, wow, that's crazy! Which contestant? Claire, yes I was very sly. Heather, I'm dying for one of those crepes right now. They sound so good! 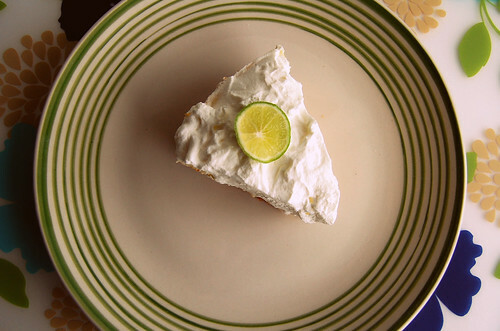 That Lime Pie looks heavenly. That pic of you and your sister is adorable. Thanks for reminding me of the first time I visited France, gosh, everything tasted so incredibly good. I've been to Paris just recently, and I too, mostly remember the food. It was great fun :) Waiting to hear more on what happened!! guess who just made your fabulous pie last night?! Marla, glad you liked it! You're awesome! 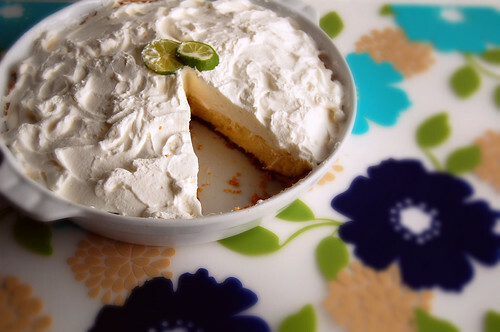 Your key lime pie is one of my favorite recipes of yours that I have tried. I bought key limes at the grocery store today. I want to make one Sunday. I have made it 5 or 6 times now, and it always turns out beautifully! Thanks so much for sharing the recipe! Jessica, I'm glad you liked this one too. :) I love key lime pie. I made this pie yesterday for my family and it was delicious & so perfect for summer. Everyone loved it! Thanks so much!